A retaining wall does exactly what it say's, it 'retains'. Exactly what that is, will depend on what it's function is going to be! When there is a situation where an amount of ground or soil needs to be 'held in position' it becomes more than a garden wall or simple brickwork. In appearance it might not differ from any other, albeit bigger in size, but it's the type of construction that allows it to hold in extreme loads in position without any physical weakness. Taking the amount of soil behind the wall as a guide you can gauge the depth of construction. The height on this wall is approximately 1400mm high so there's not a great deal to retain, nevertheless, built accordingly. Weep holes built-in to take moisture from behind the wall. Recessed or flush jointing depending on preference. From this angle you can see that guide lines are used. For brickwork, a corner is set up at either end. Guide lines would be set at every course to maintain accurate lines and levels. Blockwork is built in a similar manner. Backfilling will be completed as the wall rises to tie-in with construction. The wall has been built to it's full height. 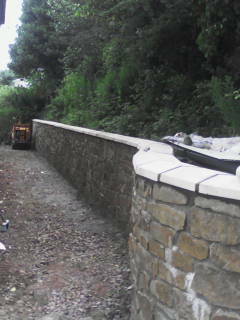 A coping stone has been fixed on top of the wall to give an attractive finish. Any moisture that would normally move freely from the ground will now escape through the weep holes. 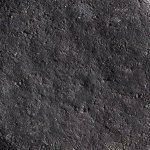 This will not affect strength or detract from the finish of the natural stone. Any retaining wall can be built straight, or alternatively can incorporate a bend or change in direction without compromising the strength or looks. The construction is exactly the same. 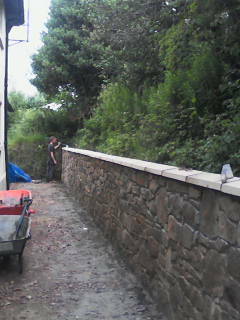 This wall carries on further to be part of a garden feature that incorporates a Pizza Oven or Wood Fired Oven as it's sometimes known. 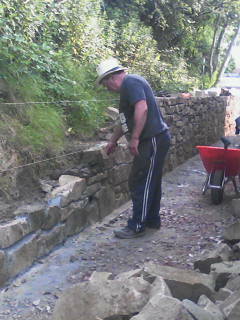 Unlike a small garden wall the base is much wider than the top and very often described as a 'boot'. As an example, if you imagine standing on the toe of someone's boot, you can push them without them falling backwards and this is the same principal that you have with a retaining wall. Look at the image below and you'll see that there is 3 metre difference in levels between high ground level and low ground level. Left hand side is the face of the wall and the right hand side is what you never see, but essential for the wall to retain it's strength and structure. 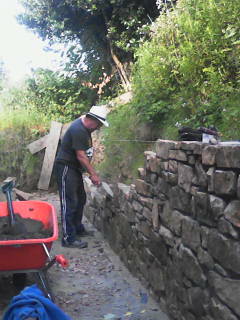 Behind the wall could be a lawn, patio, block paving or in fact anything! The pressure from soil behind the wall at the top, or middle, will not push it over or cause stress anywhere, because of the very nature of it's build. If you were to have the same pressure behind a 'straight wall', the weight or pressure will cause the brickwork to break when the build up of pressure becomes too much. In addition to the much stronger construction, the space behind the wall will be 'backfilled' with loose stone for drainage, allowing for a small amount of topsoil to be filled, if plants or grass are part of your landscaping, or maybe just stone all the way to the top behind the wall if a patio is going to be built behind the wall. 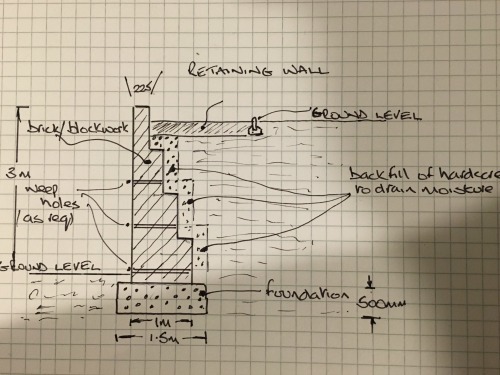 The backfill of stone is to allow any moisture to trickle down behind the wall and out through 'weep holes' that are allowed for and built-in towards the base of the wall. These freely move any moisture from the back of the wall through to the front dispersing easily to the front of the wall. Over a number of years it's possible that silt will accumulate within the backfill behind the wall and water could move less freely but can be catered for by building in additional weep holes higher, at the time of construction or added later at any time. This will not weaken the structure in any way and does more to retain it's stability and strength by allowing moisture to be released. Retaining walls including those built with logs on smaller projects are sometimes used when there is a difference in heights from one level to another and instead of altering ground levels in small increments, this can be done immediately and change from one height to another and not worry about soil at the higher level, moving under pressure. The principal is the same, make it wider at the base for strength, even with log this is possible with a little planning! This is practical when a drive is part of landscaping and the weight would create an issue or where a raised garden is necessary which can then also take the weight of a fence on top of the wall for safety. Unless your wall impedes vision for adjoining properties you will rarely need planning permission, however, a call to your local planning department will confirm this and answer any questions you have or you can contact us for more information on your own project.